NYC 8223 on the Auburn Road again! NYC 8223 is running a series of excursions on the Finger Lakes Railway up in upstate New York. The Finger Lakes Railway operates portions of the former NYC “Auburn Road” between Canandaigua and Solvay. 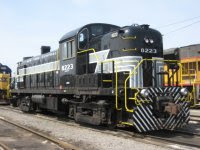 The 8223, which is usually on the Adirondack Scenic, will be on FGLK though June, when it will return once more to haul tourists into the North Country.